While browsing antique fashion plates one day, I came across this. See the dress on the right? I love the shape of the gown as it transitions from hoop to bustle. I love the color, that vibrant jade green. I adore the white overdress/apron/polonaise. In fact, I like everything about it—except for the high collar, because I get claustrophobic wearing high necklines. Sometime later, I came across a sale at Fabric.com. 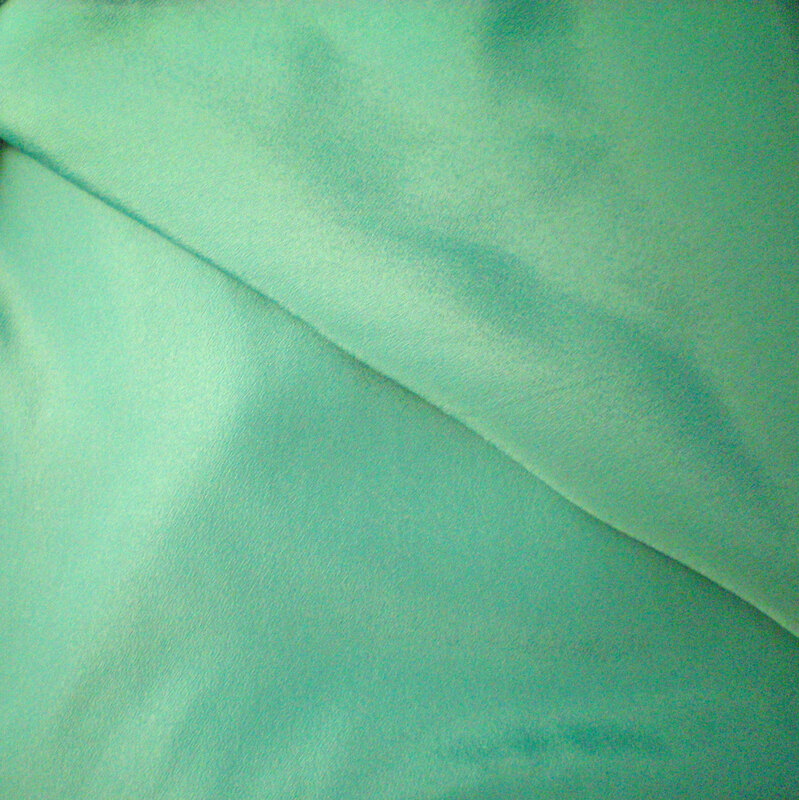 They had a jade green polyester crepe de chine on clearance for $1.99/yd! The color was perfect, and while the crepe de chine wasn’t silk, it looked like it could work. I bought quite a lot of it, more than enough to make the dress in question. I still haven’t found the fabric for the overdress. 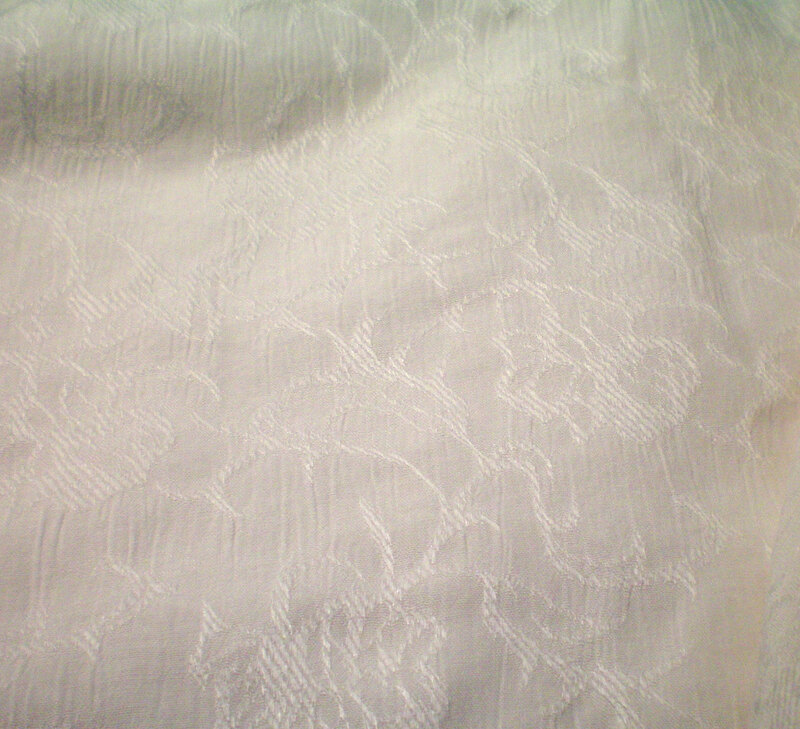 I thought I’d found it when Fabric.com had a clearance on jacquard burn-out crepe, but the floral burn-out pattern was much too large, and the fabric was quite heavy. Everything I found was either too thick, or was out of my price range. 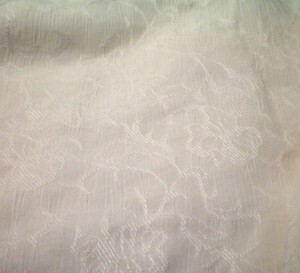 Then I found a rayon jacquard in white, with a small floral pattern, for $1.99/yd. The pattern is subtle, the fabric is lightweight, and I think it would work. It’s not my first choice—a crepe de chine or silk habotai would be ideal—and it’s actually perfect for another project I have in mind: Christine’s dressing gown from Andrew Lloyd Webber’s The Phantom of the Opera. Besides, it may be too heavy over the crepe de chine. I will probably end up ordering some silk habotai from eBay or the Dharma Trading Co. and just use that. I hate to put silk over polyester, but what choice do I have? 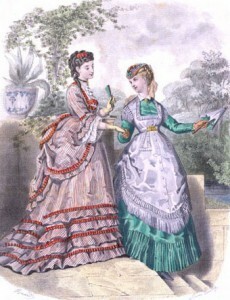 For the underskirt I will order Truly Victorian’s 1869 Grand Parlor Skirt pattern, and put the Grand Bustle underneath. The bodice would ideally be made from their 1871 Day Bodice pattern, but in order to save money I will likely modify the 1885 Cuirass Bodice pattern, which I can reuse for several other projects I have in mind. The overdress will be made from the 1873 Polonaise pattern, which (minus the sleeves) looks perfect for the front and sides. I can’t see the rear of the fashion plate, so I don’t know if the polonaise will work for the back or if it’s too fussy. I’ll have to do more research on fashions of 1869-1871, to see if I can find a rear view that is similar to the polonaise. It would be fantastic if I could make an evening bodice to be worn with the jade underskirt. This was a common practice of the time, in order to get more wear out of your expensive gown. However, I would need a second overskirt as well, since the white polonaise overdress would not work for evening. Thus, more research is required! What do you think—should I push this up my list of things to do? Will a silk habotai look okay over a polyester crepe de chine? Should I use the rayon jacquard or save it for my other project? This entry was posted in Sunday's Someday Projects and tagged Replica, Sunday, Victorian. Bookmark the permalink.